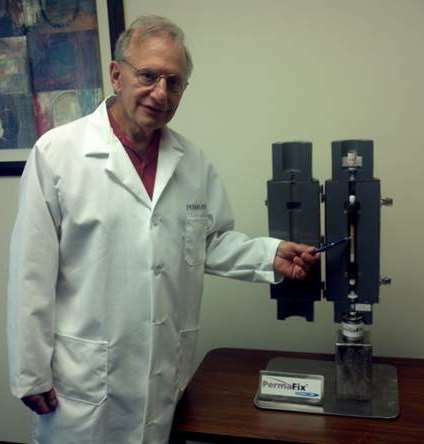 Perma-Fix Medical has developed a breakthrough proprietary process that can be manufactured to support the worldwide shortage of Tc-99m in nuclear medicine. The main shareholder of Perma-Fix Medical is Perma-Fix Environmental Services, Inc., a nuclear services company and leading provider of nuclear and mixed waste management services. Nuclear Medicine uses radiation to provide diagnostic information about the functioning of specific organs, and radiotherapy can be used to treat some medical conditions, especially cancer, using radiation to weaken or destroy particular targeted cells. Tens of millions of nuclear procedures are performed each year driving the demand for radioisotopes. The Perma-Fix Medical solution meets US and global market supply needs for Tc-99m without the use of foreign suppliers of Highly Enriched Uranium (HEU) or Low Enriched Uranium (LEU) targets. In addition, it eliminates environmental concerns associated with the current Mo-99 production methodology, including issues around reprocessing of materials and production of high level waste requiring permanent disposal. As an outgrowth of the Environmental business, Perma-Fix developed a proprietary Micro-Porous Composite Material (MPCM). This new class of resin is produced from low-cost naturally occurring materials and has the ability to separate heterogeneous mixtures at the atomic level. Easily deployed around the world using standard research and commercial reactors, thereby eliminates the need for special purpose reactors. Dr. Lou Centofanti – Dr. Centofanti has served as Board Chairman since joining Perma-Fix Environmental Services Inc., in February 1991. Dr. Centofanti also served as Company President and Chief Executive Offcer (February 1991 to September 1995) and again in March 1996 was elected Company President and Chief Executive Offcer. From 1985 until joining the Company, Dr. Centofanti served as Senior Vice President of USPCI, Inc., a large hazardous waste management company, where he was responsible for managing the treatment, reclamation and technical groups within USPCI. In 1981 he founded PPM, Inc. (later sold to USPCI), a hazardous waste management company specializing in treating PCB contaminated oil. From 1978 to 1981, Dr. Centofanti served as Regional Administrator of the U.S. Department of Energy for the southeastern region of the United States. Dr. Centofanti has a Ph.D. and a M.S. in Chemistry from the University of Michigan, and a B.S. in Chemistry from Youngstown State University. Dr. Centofanti is a recognized as a leader in waste reclamation, chemical and energy development in the Southeastern United States. He has received many awards from the U .S. Department of Energy, and from Mississippi, Florida, Alabama, and Georgia. He has spoken or presented papers at numerous scientific meetings on chemical and energy matters, and has published over 25 papers and patents. He has directed projects in the heavy chemical area and has a great deal of experience with process development and plant construction. Dr. Centofanti has also directed projects in unconventional gas, coal conversion to liquids and gases, eastern oil shale, lubricating oil utilization and PCB chemical destruction.